How Long Do Painkillers Stay in Your System, Blood, Urine? How Long Do Painkillers Stay in Your System? Painkillers are drugs administered to patients to relieve them of pains by dousing a current pain signal sent to the central nervous system. Painkillers refer to a broad family of medications for pain relief, which cuts across opiates even down to narcotic sedatives. 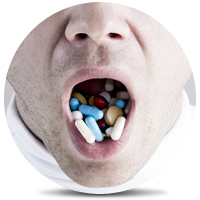 Structurally, painkillers are categorized into non-steroidal anti-inflammatory drugs (NSAIDS), paracetamol and opioids. Different types of painkillers stay in your body for different periods of time; compiling a list containing the time it takes each painkiller to clear, is near impossible. So, let’s take a quick look at the major factors that decide how long painkillers stay in your system, and then we’ll talk about the common families of painkillers. The amount of time that a painkiller lasts in a person’s body is dependent on multiple factors. From the weight of the individual and his body fats to his health and metabolism, numerous bodily functions play a significant role. Aside from this, the type of prescription also matters, which brings us to the dosage and quality of the painkiller ingested. If you have more body fats and tissues, the chances are higher that your body will more readily retain substances with a relatively lower metabolic rate (when compared to the faster metabolic rate of someone with less weight). Also, most painkillers, especially the opiate family, have a lot to do with your kidney and your liver. Thus, if the duo is not working well, painkillers, in most instances, may spend more time in your body. Lastly, the dosage is equally important. Paracetamol and opioids are reasonably sensitive to the quantity you ingest, as their activity time or peak time is closely related to the amount you took in. Having stated the factors that actively contribute to how long these painkillers remain in us, let us take a more particular look at how long these painkillers stay in our body. On the whole, opioids tend to have a half-life of a day or even much less. However, they may show up in a hair for up to 90 days. A painkiller like codeine will not stay more than two days in your urine, a painkiller like a methamphetamine may stay in a blood test up to five days. Another popular painkiller, morphine, will not stay in your saliva for more than two days. Cocaine which is one very powerful narcotic stimulant may show up in tests in your body for more than two days. Other painkillers like those in the Benzodiazepine family will stay in your body for three days or less. All these stipulated timeframes apply when the dosage is taken moderately. How the Human Body Metabolizes Painkillers? The three different families of painkillers we earmarked have their different ways in which they are metabolized in our body when ingested. NSAIDS (which popularly have drugs like ibuprofen, aspirin, and naproxen in its family) metabolize in the body obstructing the functionality of enzymes like cyclo-oxygenase. The following proteins are also referred to as (COX) enzymes. Their major work in the body is producing chemicals like prostaglandins which principally produce inflammation and pain at the spot where you had the injury or physical damage. So as NSAIDs metabolize, they eventually block COX enzymes so that the pains are not transmitted to the central nervous system. About paracetamol, much has not been done really to unveil its detailed metabolic path. But from what has been scientifically established so far, Paracetamol is believed to metabolize by mean of obstructing the COX enzymes that are in the human brain as well as that of your spinal cord. This shouldn’t take more than 5 hours. Opioids on the other hand work by bundling up with targeted opioid receptors in your central nervous system reducing the amount of reaction you exhibit to pains eventually increasing your tolerance. Opioids metabolize to a half-life in about 6-8 hours. How Long Can Painkiller Effects Last? In most cases, Paracetamol is ingested orally as a pill. The next procedure is the absorption of the paracetamol into your bloodstream via the digestive process. Paracetamol has its peak life (that is it has a full effect) within 30 minutes. Opioids do take 3 hours to 5 hours to peak and manifest maximum effects. This as well depends on how regularly you have been taking the drug. If you have been taking painkillers consistently, expect a slowdown in the rate at which they leave your body. They could accumulate in some parts of your body, taking more time for their effects to eliminate from your body. Now that you know how long do painkillers stay in your system, let’s wrap things up with one valuable piece of advice: painkillers can be a godsend when you’re suffering from intense pain. But they can become a curse very quickly because of their addictive properties. Therefore, only take the recommended dose of painkillers as prescribed by your physician and if you feel cravings to take more or continue after the recommended period, consult your doctor immediately. Addiction Resource » Addictive Substances: The Anatomy of Drug Addiction » Painkillers Abuse – How It Can Lead to Involuntary Addiction » How Long Do Painkillers Stay in Your System? if i drink a pill a day before my medical test the following day, then nurses take my urine to laboratory test what can they found in the urine if I am women and I am not taking any drug or cocaine??? can found the painkillers as the drugs in my urine?? ?